The rider in the top photo is me, while the rider in the bottom is a good friend of mine. At first glance, my friend’s photo looks more impressive, with him having his bike cranked over more than I have mine going through the exact same corner. It even looks like he’s about to blast out of that corner like a bat out of hell. The truth, however, is that I went through and out of the corners in the photo a lot faster than he did. It all boils down to our lines, lean angle, and the apex. I mentioned the apex in one of my previous entries, but to actually explain what it is in short order, the apex "allows the vehicle to take the straightest line and maintain the highest speed through that specific corner." Your lines and lean angle used for any given corner is dictated by the apex. Generally speaking, the further away you are from a corner's apex, the wider the line you have taken than necessary. This wider line necessitates MORE lean angle for you to use to make it through, thus affecting the amount of time you spend leaned over just to make it out of the corner. When throttling out of corners, the amount of throttle you add is relative to how much lean angle you take away to prevent the rear from spinning up (losing drive), or worse, low-siding from the rear end washing out from too much throttle while leant over. 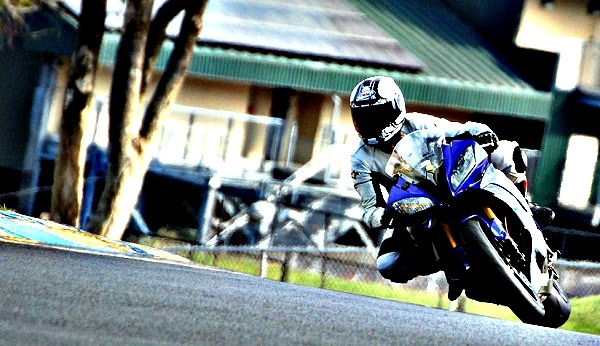 Hitting the apex, in conjunction with other reference points, means you are riding a line that allows you to go through the corner in the most efficient way, spending the least amount of time and effort to turn the bike through the corner, and allowing you to pick up the bike and twist the throttle the soonest you can. In the comparison photo above, those are Turns 12 and 13 of Thunderhill Raceway, aka “the Esses.” Subsequent corners like these are perfect examples of the approach you take being imperative for a fast line through them. Turn 13 is the curbing on the right of the photo, and Turn 12 is the curbing to the left, behind the riders. My line through Turn 12 dictated my ability to be able to hit the apex of Turn 13 as pictured above, whereas my friend’s line out of Turn 12 inevitably forced him to be further from the apex of Turn 13. Because of the minimal lean angle I needed to use to hit my apex, I was able to get on the throttle sooner and a lot harder than my friend could at the same point in the track; my friend had to wait until he could afford to stand the bike up to get back on the throttle. 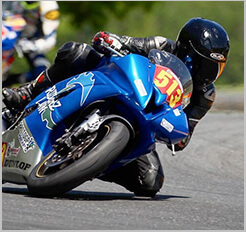 The apex is one of the triad of riding principles that makes for a solid foundation of riding discipline. They are anchors on the track to keep you and your machine in the most productive state of operation, affecting the line in which you travel, and the lean angle you must make use of to do so. There are a lot of components working in your motorcycle to travel where you want it to; the apex is there to help you help your machine work smarter, not harder.